I live very close to Aldwick Beach, on which huge rocks are placed as sea defences. There are many cracks and crannies in and between the rocks. I am fascinated by the way stones are jammed in these spaces. I wanted to keep that idea in the ‘picture’. I decided to paint the background fabric using slightly stronger colour than in the photograph. 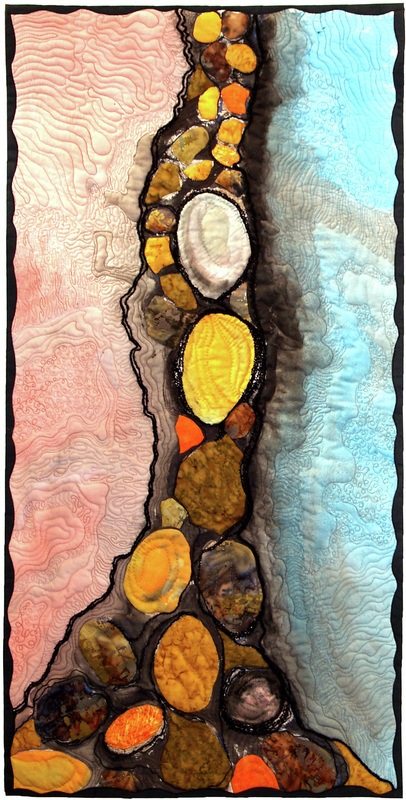 The pebbles and stones are appliquéd using various fabrics, commercial , painted and dyed. I used the woollen yarns to emphasise the outline of the fissure and to give a little texture and depth. Cotton. Applique. Hand and machine quilting.